Blood cells are created in bone marrow, the spongy tissue found inside inside the spine, ribs, breastbone, skull, hip, and shoulder bones. Bone marrow contains immature cells called stem cells which can develop into the red blood cells that carry oxygen through your body, the white blood cells that fight infections, and the platelets that help with blood clotting. Anemia develops when a person does not have enough healthy red blood cells or the hemoglobin they contain. Hemoglobin is the iron-containing protein in red blood cells that transports oxygen throughout the body, and a deficiency of red blood cells causes a lack of oxygen in the organs and cells. Reduced amounts of oxygen can cause symptoms such as tiredness, exhaustion, weakness, dizziness, paleness of skin and nails, heat palpitations, and muscle cramps. To produce hemoglobin and red blood cells, your body needs iron, vitamin B-12, folate (folic acid), and other nutrients from the foods you eat. Healthy red blood cells have a life of about 120 days before needing to be replaced. If the body’s red blood cells production is impaired, or the cells are being destroyed faster than the body can replace them, anemia develops. There are several types of anemia. Some of the most common are listed below. Iron is necessary for the production of hemoglobin, the molecule in the blood that carries oxygen. Iron is absorbed from the food we eat by the cells lining the gastrointestinal tract. Diets without no animal protein can contribute to low iron levels. Iron is stored in the liver, where it is released as needed to make new red blood cells in the bone marrow. In addition to iron, your body needs folate (folic acid) and vitamin B-12 to produce sufficient numbers of healthy red blood cells. Some people may eat enough B-12, but their bodies aren’t able to process the vitamin. This can lead to vitamin deficiency anemia, also known as pernicious anemia. 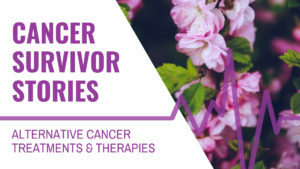 Diseases that affect bone marrow like leukemia, lymphoma, and multiple myeloma can affect blood production and cause anemia. In aplastic anemia there is marked reduction or absence of stem cells due to infections, autoimmune diseases or drugs. This decreases the production of red blood cells causing anemia. In hemolytic anemia, there is premature and excessive destruction of red blood cells, and the bone marrow is unable to replace them quickly enough. Dietary changes may help you to keep your hemoglobin and red blood cell levels healthy naturally. Try including the foods listed below in your diet to support healthy blood levels. • Folic Acid is essential for the production of new red blood cells in the body. Some medications can interfere with utilization of folic acid and cause anemia. Sources of folic acid include lentils, dried beans, peas, brussels sprouts, banana, corn, beets, pineapple, peanuts, spinach, green beans, sprouts, chickpeas, and brown rice. • Vitamin B12 is needed to make new red blood cells in the body. Prolonged use of certain medications may also interfere with absorption of dietary vitamin B12. Milk, green leafy vegetables, meat, eggs, and fish are good sources of vitamin B12. • Vitamin C can increase the absorption of iron, especially non-heme iron. Vitamin C is rich in citrus fruits, kiwi, strawberries, bell peppers, kale, and mustard greens. Increasing uptake of Vitamin C can cause excretion of folic acid from the body. 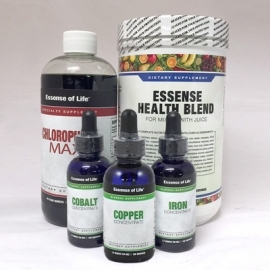 • Chlorophyll, in the form of sodium copper chlorophyllin, was found to promote the proliferation and differentiation of stem cell function and increased peripheral blood white cell and platelet counts, thereby improving immunoregulatory capacity in one study on mice with aplastic anemia. Chlorophyll, the pigment that gives plants their green color, is part of the process plants use to produce energy through photosynthesis. The molecular structure of chlorophyll is almost identical to that of hemin in hemoglobin, a protein in blood that transports oxygen throughout the body. The only difference in the structures of hemin and chlorophyll is the central atom: in hemin it is iron, while in chlorophyll it is magnesium. Because of the similarities between chlorophyll and hemin, chlorophyll is able to assimilate into the body where it can aid in rebuilding blood cells. Chlorophyll has been observed to increase the speed of hemoglobin regeneration. Supplementing with chlorophyll is a great way to ensure that your body is getting the maximum benefits from chlorophyll intake every day. Each serving of Chlorophyll Max liquid ionic supplement contains 30 mg of chlorophyll as copper-sodium chlorophyllin derived from alfalfa. Because it is water-soluble, chlorophyllin is readily bio-available and easily absorbed, unlike natural chlorophyll (derived from dark, leafy greens and wheatgrass juices) which is not water-soluble. 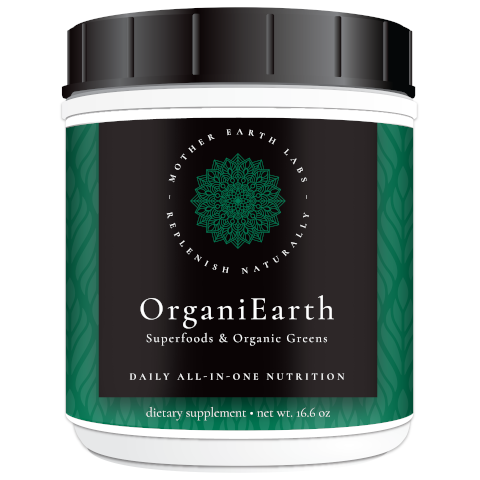 Chlorophyll and chlorophyllin have potent anti-oxidant, anti-carcinogenic, and anti-mutagenic effects. 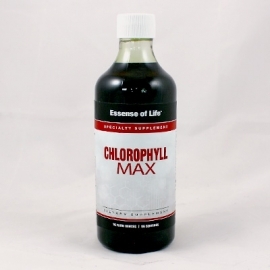 Chlorophyll Max has a pleasant minty flavor, and can easily be added to green juices and smoothies, or used in a tasty refreshing Minty Chlorophyll Detox Water drink. This article is copyright ©2014 Essense of Life. All rights reserved. Do not copy without permission.